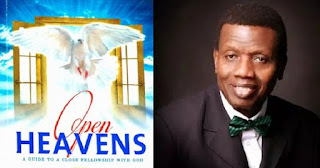 Open Heavens [1 May 2018] The Reward of Diligence - Open Heavens Daily Devotional Messages, By Pastor E.A Adeboye. In this same parable, we also see the direct opposite of diligence and its consequences. The servant with one talent mischievously kept the talent and refused to trade with it. His reward was the loss of his talent and outright rejection from the joy of his lord. On the other hand, the diligent servant who started with five talents gained the talent that was taken away from the indolent servant, and ended up with eleven talents in all. Proverbs 27:23-27 further highlights the rewards of diligence. The Lord promised to bless the work of your hands, not your idleness. Know for sure that faithful is He who has promised you this, and He will fulfil all He has said if you diligently play your own part (Deuteronomy 28:1-5, Hebrew 10:23).